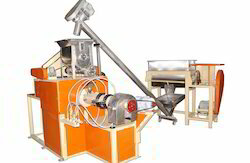 Manufacturer of a wide range of products which include soya nuggets extruder machine. Our firm specializes in offering the best quality Soya Nuggets Extruder Machine that is used for processing soya nuggets or bari. Our provided machines are using superior quality raw material and excellent techniques as per the set industry norms and standards. Apart from this, our offered machines are available in various specifications to suit their application. Low maintenance, easy operations, longer service life and easy installation are some of the attributes of this extruder. Electrical panels, cables, starters, switches etc.